The project represents Sun Light & Power’s ability to deliver large, complex projects in challenging environments. Berkeley, CA, February 19, 2019 --(PR.com)-- California’s pioneer solar company, Sun Light & Power, has successfully completed the installation of a 905kWp solar array atop the new long-term parking garage at San Francisco International Airport. Sun Light & Power worked with SFO, Nibbi Brothers General Contractors and solar panel manufacturer REC Solar whose panels were purchased for the system. 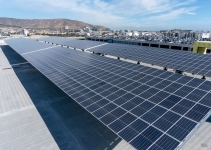 Photo caption: The solar array installed atop the parking garage at San Francisco International Airport by Sun Light & Power features REC Solar panels. The project represents Sun Light & Power's ability to deliver large, complex projects in challenging environments.